You guys know Water Wing Records by now right? Alex used to co-own the great Mississippi Records and has gone on to start this offshoot label out there in Portland and that's as far as you need to get in his resume to know this release is coming from a guy who takes his releases pretty damn seriously. 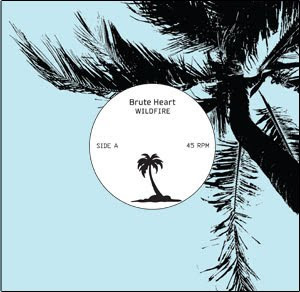 He sent me a copy of their latest single from Brute Heart a Minneapolis based three piece who have already put out a few things on M'ladys Records and now get the Water Wing stamp of approval as well with these two versions of "Wildfire". The A-Side straight up version of the track is a weird combination of elements and influences all under the umbrella of this hypnotizing reggae dub sound. Imagine if Grass Widow's complex off kilter rhythms and harmony patterns went in a Clash direction and embraced some of that King Tubby doubled reverb sound? On paper it couldn't possibly make any sense. Oh yea and add a viola in place of an electric guitar, which I wouldn't have possibly known if I didn't check out these liner notes, completely haunting, innovative substitution. Crystal Myslajek, on bass, is after those slow reggae influenced dub lines, and that viola goes under serious overdriven reverb for that groove to take this into a completely unexpected place. She and Jackie trade off layering vocals in completely different registers for a swirling dream psych opposite of anything resembling Grass Widow in final product actually. Then Crystal Brinkman (that's right two Crystal's) pulls out this completely off base percussion pattern that had me questioning if there wasn't some sort of manipulation after the fact with her live performance. It's impossibly halting, without a natural sort of pattern. It's really impressive, until you starting listening to the rest of the pieces, which are constantly raising that bar. This entire track is playing with some interesting directions that at first seem obvious, then completely baffling...and that's where I'm at. Still figuring out where they ended up with this complex, unique sound. The B-Side (don't call it a remix) is a reconstructed version by Alex Yusimov and Jason Powers who sound like they might be pushing the reverb a little bit further, but still highlighting their own weird brand of dub. Emphasizing the vocal, a heavier delay, real bottom of the canyon viola shrieking and bouncing off the walls. Feeling a bit darker as well under these heavier blankets of psych and opting for the straight bass and drum stutter strum ragga sound. Emphasize the core elements for the dancehall mix. 12" DJ cut coming soon. They also did a live performance where they scored The Cabinet of Dr. Caligari? Please tell me this could be some kind of release that you could play at home along with the movie? That could be a whole new era of silent theater. Different bands interpreting maybe that same particular film? How many singles would that be? I'm going insane. Pick this up over at Water Wing Records, on black vinyl in center hole cut heavy card stock tropical sleeve...which in hindsight makes perfect sense. Brute Heart is Jackie Beckey, Crystal Brinkman, & Crystal Myslajek, from Minneapolis. The bass, drum viola trio has been effectively blowing minds since 2007. BRUTE HEART has unleashed two LP's, as well as a killer 7" on M'LADYS. Now they have reached down into a deep reverb tank and pulled out "Wildfire", the A side to their new WATER WING 45rpm. Dub rhythms and pulsating bass lines collide with their usual layers of underwater vocals. Like their SOFT ABUSE LP, "Lonely Hunter", "Wildfire" was recorded by Minneapolis engineer, Mike Wisti (Mother Of Fire, Skoal Kodiak). In true dub fashion, on the flip is a re-mix of "Wildfire" deconstructed and rebuilt by the recording studio team of Alex Yusimov (Mirah, Grass Widow) and Jason Powers (Grails, Scout Niblett). Digital Download Included. I'm getting massive Explode into Colors vibes from this.